Military honors:National Defense Service Medal, Selected Marine Corps Reserve Medal. 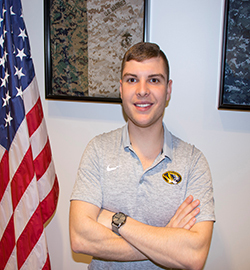 Campus/community involvement: Mizzou Student Veteran’s Association, Central Missouri Honor Flight, SALUTE Veteran’s Honor Society, Kappa Omicron Nu Honor Society, United States Green Building Counsel – MU Chapter, & MU Student Environmental Design Association. Favorite campus tradition: Since arriving on campus, one of my favorite traditions is the Annual MSVA Pub Crawl. Each year the exec board and members vote on a theme and compile a list of Downtown Columbia establishments to patronize as a celebration of another completed year at Mizzou. We usually choose a date in late April or early May so it ends up being a great way to head into finals week. Advice you would give to other student veterans: Get involved and get to know the other student veterans around campus. The University of Missouri has hundreds of organizations to choose from and they’re a great way to get to know other students. As a student veteran, stopping by the Veterans Center break room is a really good way to meet others and also serves as a great place to network with likeminded students. There’s always coffee brewing too! Favorite Columbia hangout: During breaks between classes, it never seems to fail that I end up at the Veterans Center chatting with the other regulars. Whether it be stories of the past or a debate on current issues, the conversation is usually lively and a lot of laughs are shared.